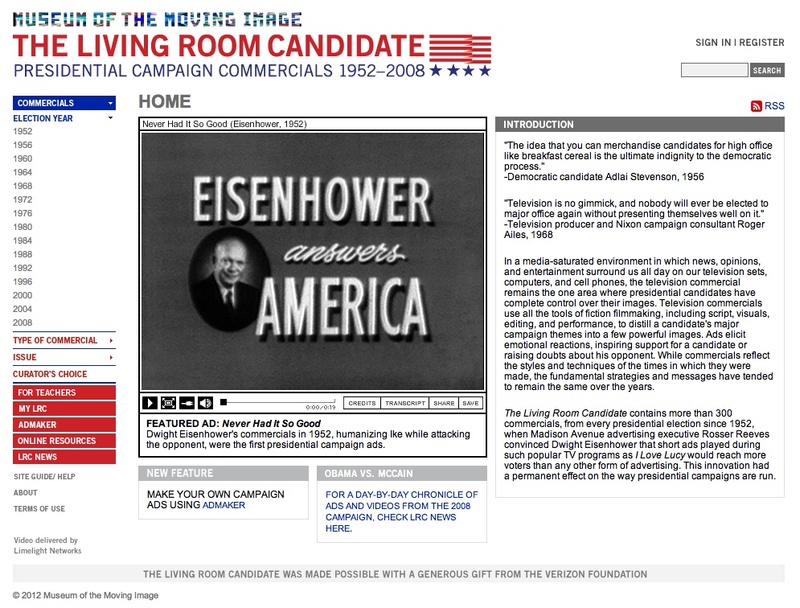 Managed by The American Museum of Moving Image, the Living Room Candidate is an innovative online exhibition of US presidential campaigns TV commercials, with more than 250 television political ads from every US election year beginning in 1952. Users can watch nearly four hours of TV commercials and explore the expanding world of web-based political advertising. The site includes a searchable database and features commentaries, historical background, election results, with navigation organized by both year and theme. Each commercial selected is accompanied by a list of related commercials in order to guide the viewer through the collection. The exhibition also features a sidebar section, “The Desktop Candidate”, about the growing role of the internet in presidential campaigns, as well as other TV appearances and speeches by recent US Presidents. Based on a simple, multimedia design, the Living Room Candidate provides video files for free and in various formats. A professionally-managed, content-rich resource for both the general public and teachers.